Posted on Fri, Jan 21, 2011 : 5:58 a.m.
Mark Hodesh, owner of Downtown Home and Garden, will return to his roots this spring when he offers an open-air courtyard of seasonal food carts behind his popular retail location on South Ashley Street in downtown Ann Arbor. Hodesh, who operated the Fleetwood Diner decades ago in its early days, is turning the single-story Union Building, 208 W. Liberty, he owns behind Downtown Home and Garden into a commercial kitchen and will rent space to up to 10 independently owned food cart operators on a small parcel of land behind his store. Mark Hodesh, owner of Downtown Home & Garden, will add a unique dining option to downtown Ann Arbor when he opens "Mark's Carts." The idea came to him late last summer, after the long-time tenant of the Union Building left. The 3,000-square-foot building is being renovated to accommodate a commercial kitchen, which will be used by the cart owners, Hodesh said. Half of the building will be dedicated to the kitchen. Cart owners will pay a single fee, which has yet to be set, to use the kitchen and rent space in Mark’s Carts. Mark’s Carts will occupy a 2,700-square-foot parcel of vacant land that fronts West Washington Street, behind Downtown Home & Gardner. The area will be fenced, landscaped and lighted, and will include seating. “It will knit together the area,” Hodesh said. While the food carts won’t begin operation until April for this season, Hodesh wants future seasons to run from March to late November. The area will include some covering but will not be enclosed. Work on the area began in late fall but halted with the winter weather. While he has not yet signed leases with the food cart operators, Hodesh has had strong interest. Possible operators include Asian street food such as steamed buns, Korean barbeque, wood-fired pizza, hand-made tacos, grilled cheese and soup and vegan/vegetarian. While each cart owner will set their own hours, Hodesh said he expects breakfast, lunch and dinners to be available. Hodesh said he expects to begin signing leases in February. It will be chance for people thinking about opening a restaurant to test the waters, an opportunity for displaced workers looking for a career change to begin a business without expensive overhead and a chance for young people enthusiastic about food to try their hand, Hodesh said. It will also be a smooth transition between the residential and downtown neighborhoods, he said. The land is too long and narrow for commercial construction, especially with the current economic climate, Hodesh said. The property where the carts will be located was once owned by the city and used for the third floor ramp to the adjacent parking structure. When the parking structure was razed, Hodesh purchased the property. It has come full-circle. The house of Herman Hertler, one of the owners of the original Hertler Brothers feed and seed store, which occupied the Downtown Home and Garden space, at one time rested on the land. 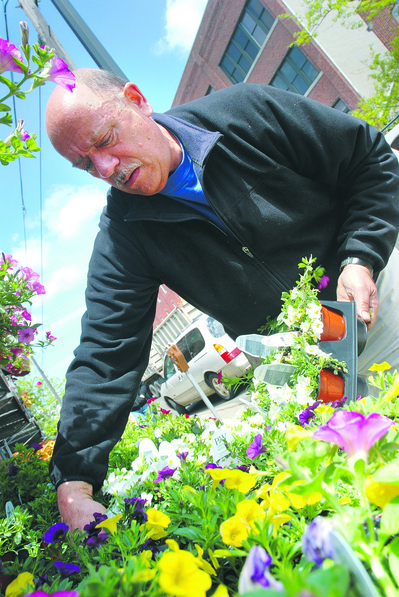 Mark’s Carts isn’t the only change coming to Downtown Home and Garden this spring. Hodesh won city approval last fall for construction of a second greenhouse that will be connected to the west side of his store. Tue, Jan 25, 2011 : 7:18 p.m.
Be sure that the vendor who is preparing food and collecting money has a way to wash his or her hands in fresh running water. Food carts are nice and the food can be good, but sanitation can be a problem. I've seen these solo vendors prepare food (even with latex gloves) and then handle cash with the same gloves on. Some are too lazy to change gloves for every transaction, or too lazy or cheap to take them off for cash transactions and then put on a new set of gloves for food prep. This is not sanitary and a violation of food prep laws. If it truly is to be a stand-alone &quot;cart&quot; set up then this needs to be addressed. If it is a &quot;cart&quot; attached to a building with a sink, then it would be better. If 2 people work the cart, it's better, one for cash and one for food, but access to a sink to wash hands during food prep is mandatory. Fri, Feb 18, 2011 : 3:44 p.m. Wed, Feb 2, 2011 : 6:20 p.m. If you were really concerned you could do some research concerning mobile food vendors and their licensing requirements. All carts require a handwash sink and must meet Washtenaw County health dept requirements regarding handwashing. Besides, if you only knew what happens at the restaurants you eat at. Not every place that serves food is 100% every time. Humans are not perfect. Please before you make commentary on subjects you do not know, do a little research. Sun, Jan 23, 2011 : 11:19 p.m. This sounds great! I'll be sure to stop by. Sun, Jan 23, 2011 : 5:37 p.m. Excited for this, especially the &quot;vegan/vegetarian&quot; possibilities! Sun, Jan 23, 2011 : 3:58 p.m.
very cool idea! my OWS neighbors will be as excited as I am for this delicious addition to our neighborhood! Sun, Jan 23, 2011 : 1:11 a.m.
That's great news. We had lots of fun coming to Mark's birthday party at the store with the Mity Nice Italian Ice Cart. We're happy to see more carts coming out to play. Sat, Jan 22, 2011 : 11:04 p.m.
Love this idea, esp. handmade tacos. Sat, Jan 22, 2011 : 4:27 a.m.
Great idea. Ann Arbor has always needed something somewhere in between finer restaurants and burger joints. Food carts are more free to experiment, and have less barrier to entry for the owners, so hopefully we're going to see some really new and interesting street food popping up here (and elsewhere). Sat, Jan 22, 2011 : 12:43 a.m.
Food trucks would be another but not sure if demand would support it. Fri, Jan 21, 2011 : 7 p.m. Kudos to Mark who helps make Ann Arbor a great place through Downtown H&amp;G! It's a great store with lots of vitality and creativity. I hope this new idea works. Sounds great. I'd like to put in a request for a gluten-free food cart. Fri, Jan 21, 2011 : 5:19 p.m. I'm glad to see the street food carts concepts starting in Ann Arbor. This is a chance to find great food brought to us in an easier manner that traditional bricks and mortar restaurants in which an entrepreneur will go broke trying to get started before they even serve their first meal. Fri, Jan 21, 2011 : 4:07 p.m. This is really a fantastic idea...and I know a few of the cart-folks who are going to be leasing space - and they have GOOD food. Mmmmm! Fri, Jan 21, 2011 : 3:52 p.m. Please let there be a cart with doner kebabs. Fri, Jan 21, 2011 : 3:48 p.m.
Great idea Mark! This should make doing business possible for many small, local people. Fri, Jan 21, 2011 : 3:45 p.m.
Fabulous idea! I can't wait to sample from the various carts on my lunch hour. I hope this is a huge success for Mark, the vendors, DTHG and the community. Yum! Fri, Jan 21, 2011 : 3:19 p.m.
Somebodys going to get rich serving the bar crowd, great idea i've seen this work well in other citys. Time to work on my sliders recipes. Fri, Jan 21, 2011 : 1:49 p.m.
Wow, what a great and creative idea. I hope its a huge success, and that we get some new and interesting foodways at this site! Fri, Jan 21, 2011 : 1:24 p.m.
Late night vendors would make a killing selling to the less-than-sober--it is right in a triangle of several popular bars. Excellent idea! Fri, Jan 21, 2011 : 11:15 a.m.
interesting concept. We don't have any good quick take out places in downtown AA along Main Street.....well....except of course for LeDog. For this to succeed the idea is going to have to catch on quick with the local area workers. fyi...the best lunch deal in downtown AA is the $2.95 burger at Blue Tractor on Mondays.....best $3.00 burger in downtown AA......wonder how long Blue Tractor will keep this special?